Pavement hawkers in Pettah. Pic by Athula Devapriya. Sri Lankan pavement hawkers, on one hand a menace to pedestrians while on the other a crucial vote base for politicians, are to be provided legitimacy by making them taxpayers. The proposed tax is aimed at making them contribute towards the economic development of the country, reducing the number of street vendors, maintaining cleanliness in the city and minimising the hassle to pedestrians, official sources revealed. AG’s department sources said imposing a tax or levying a rental will give legitimacy to the pavement trade. A source said that municipalities are bound by law to maintain the pavements for the use of pedestrians. Leasing of payments is willfully denying pedestrian rights, he said. Hawkers across urban cities in Sri Lanka will come under a tax scheme for the pavement trade and non-formal market a senior government official said. “There should be some control in prices of consumer items up for sale on pavements and hawkers should not vary the prices, otherwise the standard price structure would be affected,” he said. He pointed out that hawkers mainly sell readymade garments, purses, watches, socks, mobile accessories, sunglasses, shoes, gift items and several other consumer items at extremely cheap prices when compared to the price at which the shops in the vicinity sell for, as they do not pay taxes, rent or electricity bills. The imposition of a tax on goods being sold by hawkers on the streets would give legitimacy to their business, helping them to improve their standards and get a decent place for them to do their day to day business after some time. The government will also introduce a low interest loan scheme for pavement hawkers to continue their business moving away from streets. 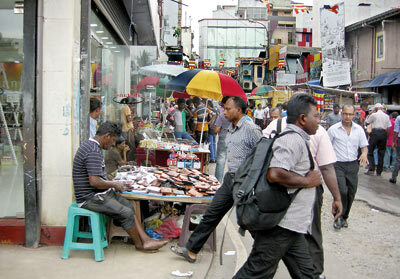 The number of pavement hawkers in Sri Lanka is nearly 25,000 out of which around 3,000 are in Pettah. However, according to police and municipal council reports this number is 6,000. Colombo Mayor A. J. M. Muzammil told the Business Times that no rental is being levied from pavement hawkers at present but there is a plan to introduce such a system and implement it with the assistance of the police. The Colombo Municipal Council is currently collecting data of pavement vendors with the aim of providing redress for them. The pavements on a few streets especially the First Cross Street and the Second Cross Street in Pettah and several other towns in the country have been occupied by the hawkers again although they were given alternate stalls in 2010 by the Colombo Municipal Council and other local government institutions to carry out their businesses. Mr. Muzammil noted that hawkers would not be allowed to do business on the main streets of Colombo. However they have been granted permission to have their stalls in the cross-streets as a temporary measure. He disclosed that a large number of vendors who have stalls at Bodhiraja Mawatha and 5th Cross Street have rented out their stalls. The people who were given shops are not there now. They do not even pay any rent to the Municipal Council. “The people who have rented out the stalls given to them are also doing business on the streets. There was political pressure.” he said.This has become a nuisance for pedestrians at present and the government’s move to impose a tax on them is expected to ease this problem to a great extent as most of them will not be able to cope with tax payments and at the same time sell cheaper than the established market, officials said. The pavement hawkers’ culture has existed for a long period in Sri Lanka with political patronage as it has become the livelihood for many low income earning families. “So, whether we like it or not, we have to live with pavement hawkers till the government’s plan to uplift their living standard bears fruit,” one official said. More than 600 global policymakers, businesspersons due here for global export parley in Oct.